I upgraded my old incubator with an Incukit Mini! This post shares the step by step process I used to convert a still air desktop incubator with a wafer thermostat to a forced air incubator with an automatic digital thermostat. The kit i used, the Incukit Mini, can also be used to turn a styrofoam cooler or other container into a homemade incubator. I have two desktop incubators and both of them have manual thermostats. These incubators work great if your room temperature is fairly stable and they are used successfully by many poultry enthusiasts. However, if your room temps rise and fall a great deal you will have trouble maintaining the proper temperature for the developing embryos. The Incu-kit mini from the side. 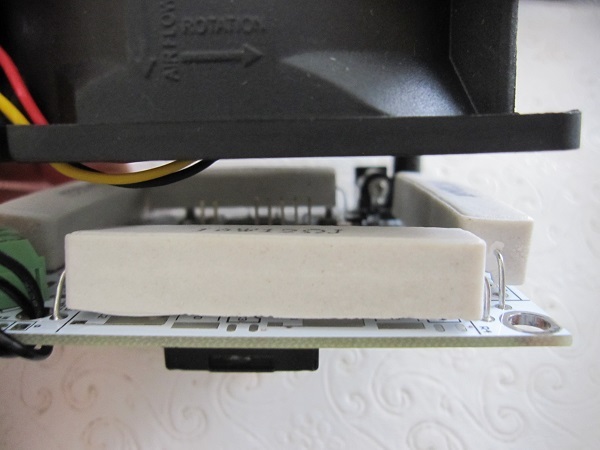 The bottom view of the Incukit Mini shows the circulating fan. It has a cover to prevent chicks from being injured by the fan blades. Here is the set up of my old incubator. You can see the metal heating coil and the control box that needed to be removed. Incubator with all the guts removed. Since I’m upgrading an old incubator, I had to remove the old thermostat and heating element before I could install the Incukit. The bolts came out easily and the deconstruction was painless. I was ready to install the new unit. I cut out the hole for the Incukit Mini digital display and controls to show through the top of my incubator. I used a handy steak knife for the ‘delicate’ procedure, following the template included on the back of the instruction sheet. 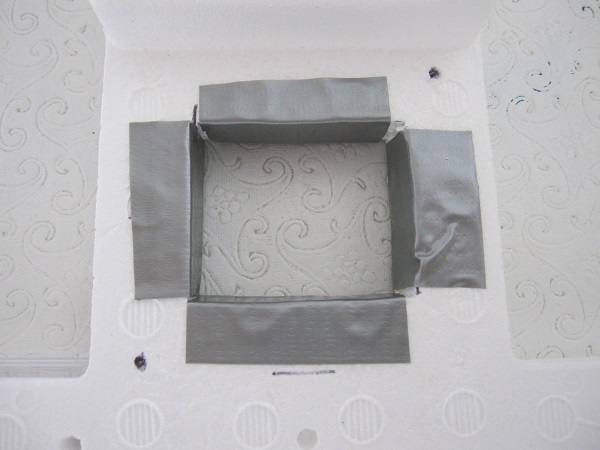 I used the template from the back of the instructions to mark out the hole in the styrofoam for the display. Cutting out the hole with a kitchen knife. I should note here that I wasn’t able to cut the hole in the center of the top, unfortunately. 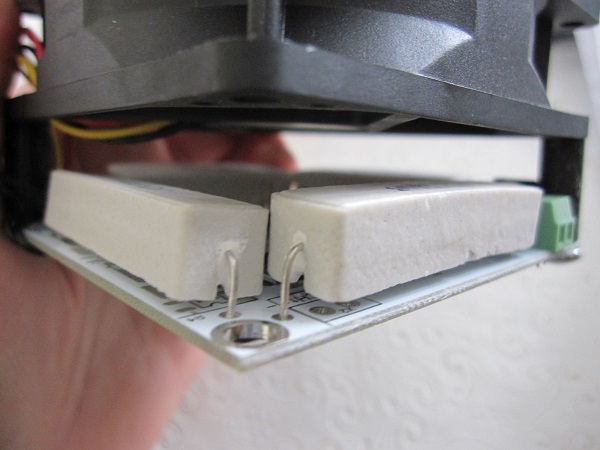 Due to the shape of the incubator lid, the heater and fan kit would’ve hung down very close to the hatching surface. I’m not particularly happy with the placement of the Incukit off to one side of the incubator because I was concerned it would cause uneven temperatures. However, I had already disassembled the old incubator and figured I would give it a go. If you are considering upgrading an existing incubator, check to see if you’ll be able to fit the Incukit in the center before you start. Hole for the display, with the classy addition of some duct tape to keep the styrofoam from shedding. The two dots show where the bolts will go. I also wasn’t happy with the little bits of styrofoam rubbing off the sides of the new hole . So I used the handyman’s secret weapon, duct tape, to cover the rough edges and prevent the styrofoam from breaking off. 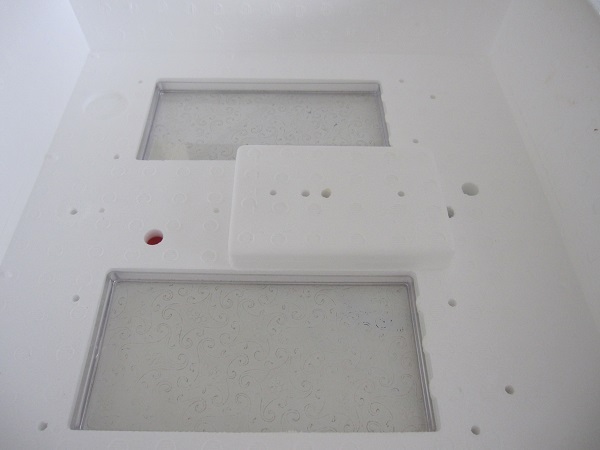 I checked to make sure that the digital display fit properly through the new hole and marked the holes for the bolts to fasten the kit to the inside of the incubator top. Two small black tubes were included to poke through the styrofoam for the bolts to fit through so the styrofoam wouldn’t fall apart. 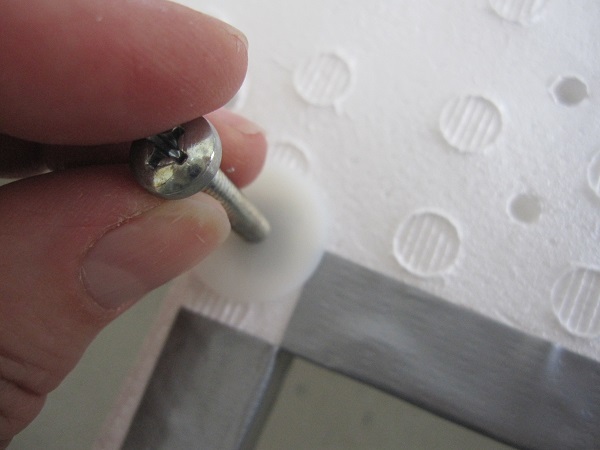 I put another little square of duct tape over each hole in the styrofoam, then made holes for the bolts. I purchased longer bolts than the ones that came with the kit. When I thought I was nearing the finish line, I hit a snag. 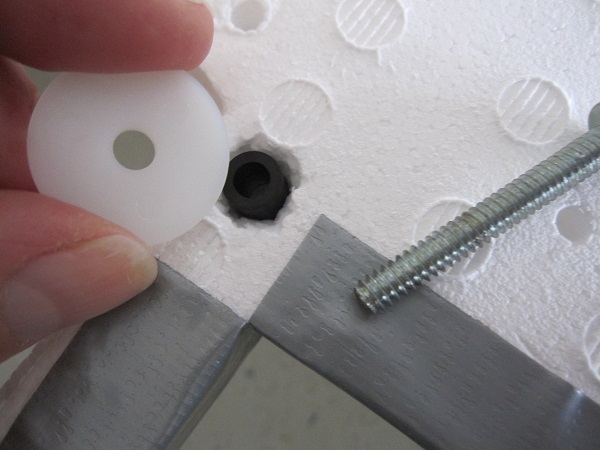 The bolts included weren’t long enough to secure the Incukit to the bottom of a styrofoam lid that is about 1″ thick. Drat! 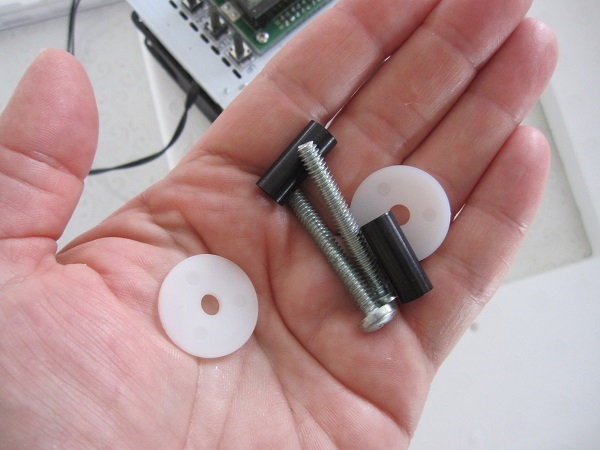 A search mission through all of our odds and ends of screws, bolts, and other fasterners saved from previous deconstruction projects yielded no winners and I had to run to the hardware store for the proper size (#10, 2″ bolts did the trick). New Incukit Mini installed and heating up. 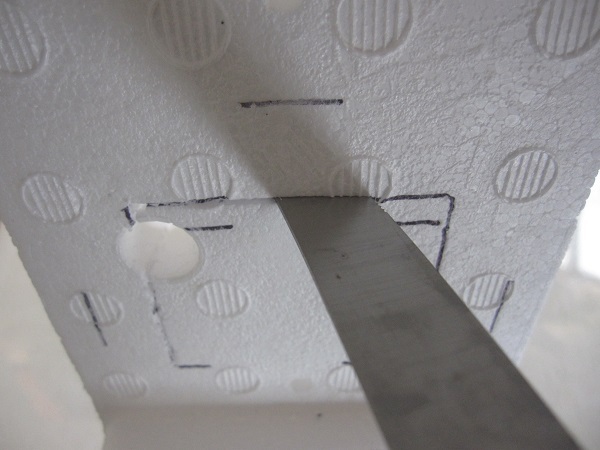 I covered all of the miscellaneous holes in the styrofoam with duct tape to reduce heat loss (I’m wondering if the handyman’s other secret weapon, spray foam inuslation, might come in handy here? ), plugged the AC adapter (threaded through an existing vent hole) into the Incukit Mini, plugged in the power supply, and waited for the temperature to stabilize. 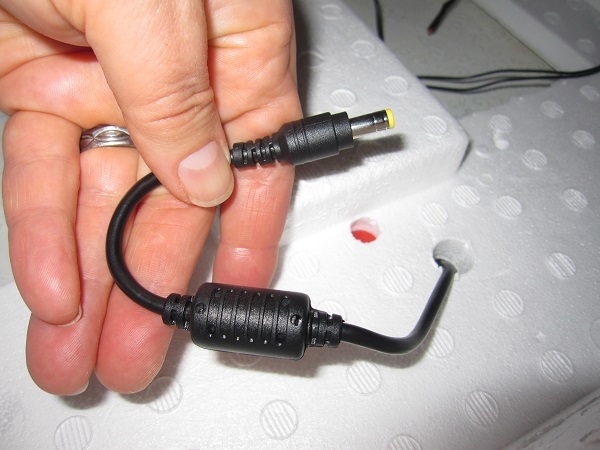 Plugging the AC adapter in. After several hours the temperature was still not reaching 99.5 F, the proper temperature for incubating chicken eggs. I contacted Incubator Warehouse and explained the problem. They wrote back quickly and told me to change the OSP slope setting from 0.25 to 0.10 and I made the change and waited to see if this did the trick. 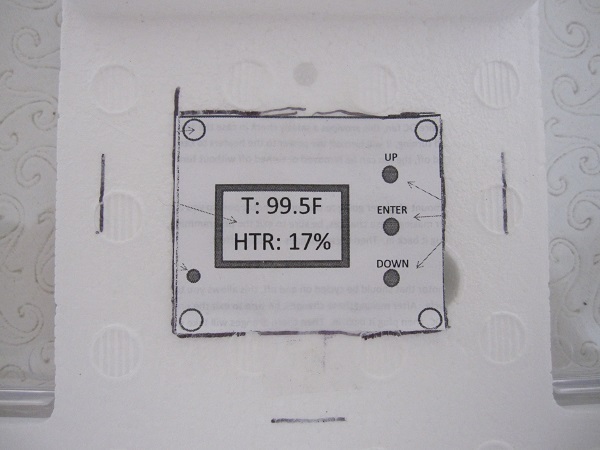 This is the sensor…it should be taped in place so it rests just about where the tops of the eggs will be. I left the incubator overnight to see if the temperature was correct and found that it was still reading 98.9, give or take a little. I put a digital thermometer in the incubator, close to the Incukit heater. The reading reached 99.7 and held pretty steady. 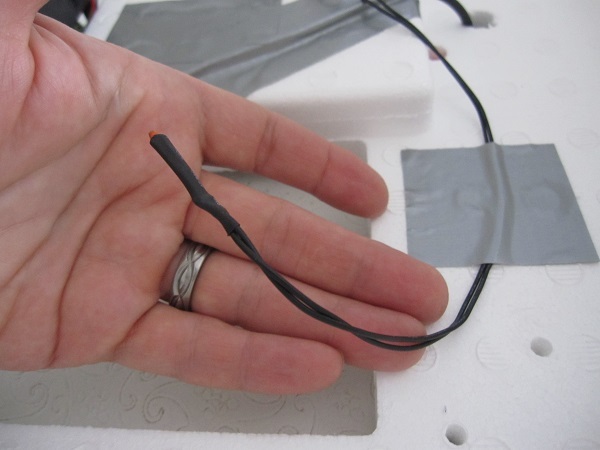 The Incukit sensor was taped in place at the opposite end of the incubator, hence the difference in temperature readings. Again, I’m not happy having the new Incukit installed off to one side of the incubator. 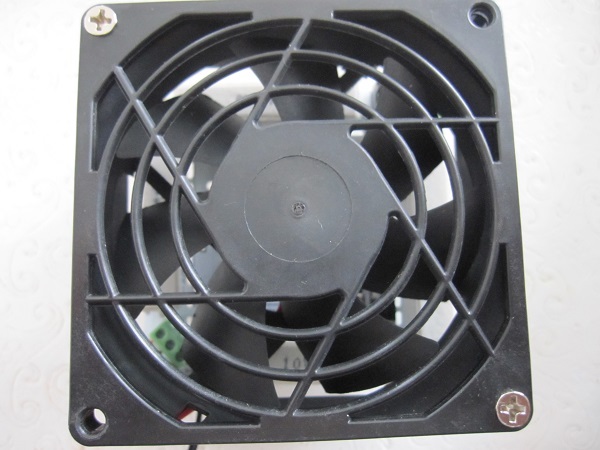 I originally thought that the circulating fan would even out the temperature inside the incubator, but it doesn’t seem to be. To accomodate the temp differences, I put all of my eggs on the side of the incubator closest to the Incukit heater. I let the incubator run over night and added 32 eggs from my chicken flock this morning. In 21 days I will have a better idea if the installation of an Incukit will make my incubator more reliable and increase my hatch rates. I still have one more incubator to upgrade with the other Incukit Mini I ordered and I can see that the shape of the incubator lid will accomodate the unit in the center instead of off to one side. So I’m sure that the set up will be much better for this project. If my first incubator conversion project doesn’t work as well as I’d like, I will go ahead and search for a small cooler that will allow me to take the Incukit Mini out of this incubator to set up a new one. Then I will re-install the old heating unit and either keep the old incubator for a back up or maybe I’ll sell it on Craigslist. Have you ever used an incubator with a proportional (automatic) thermostat? Or are you interested in upgrading an incubator with a manual thermostat? I’d like to know if this article has been helpful…please leave a comment to let me know! Update: I retrofitted two incubators this way and have gotten a lot of use from them. The temperature remains much more stable than with the wafer type thermostat and I am very happy with them. I use the two incubators to hatch chicks, ducklings, and turkey poults for my homestead. Note: I did not receive any compensation from Incubator Warehouse to review this product. I purchased two Incukit Minis to upgrade my incubators and share the process and information with others. The following links to the Incukit Mini and other products that might interest you are affiliate links. 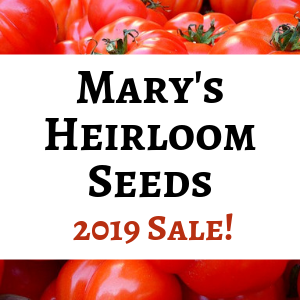 You will not pay any extra for these if you purchase these products through the links I share, but I will make a small commission…Thank you for supporting The Self Sufficient HomeAcre! I enjoyed reading your conversion project. I have been wanting an incubator for awhile now but couldn’t justify the cost. Your post lead me to building my own and now I think I have collected all the parts I need and I just need to put it together. I’m so excited, hubby is not. Somehow he thinks my flock is already out of control. (26 chickens I think and 12 ducks.) Its all good, we will just eat the extras. So on to my questions. Everywhere I read on the web it says to only use clean eggs, well I only have dirty ones so can I clean them and go for it or is that a bad thing? I remember in one of your posts you said that your eggs are not the cleanest either so I am wondering how you have solved this problem? Also the humidity seems to vary on different sites. How critical is it and where should it be? For now I will be experimenting on hatching duck eggs at least until I find a new rooster. Mine died on me and I haven’t been able to figure out why. Good questions! First…you asked about hatching dirty eggs. It will depend a lot on how dirty they are and if oxygen is still able to move through the dirty shell. If the egg is completely coated in egg yolk, manure, or something like that…it is much less likely to hatch. There is also the possibility of bacteria growing in the egg and causing it to burst from the gases caused by decomposition…not a nice smell in your house! You hubby would definitely have something to say about that. 😉 If there are just a few dirty spots it isn’t as likely to kill the developing embryo or start rotting. I have some eggs that are a little bit dirty in my incubators right now. Now, having said all of that, I have incubated some very dirty eggs that actually hatched and survived…so, go figure. I wouldn’t wash the eggs no matter how dirty they are because that removed the protective coating and I think those would be less likely to hatch. I haven’t tried it, so I’m going by what I’ve read. What I would suggest is that you try to collect the eggs more often to keep them from getting dirty and use the cleanest eggs for hatching. You might want to try a smallish hatch the first time to see how things go. I hope all of this helps! Let me know how your project goes! I got my DIY incubator all put together and and its up and running. 🙂 Those little fluffy ducks are scheduled to hatch on the 19th. So far all seems to be going well, not that I really have a clue what I’m doing. I collect my duck eggs first thing in the morning, even before breakfast, but the eggs are all laid before then and already dirty. I hardly ever get any eggs laid after that first collection. I’m guessing its because I have a light in their coop for the winter and unless I get up at 4:00 am its not going to change the cleanliness of the eggs any. Even in the summer without the light the sun is up early and the eggs are laid. I am not a morning person. I did my best and cleaned out the nest boxes and refreshed the pine shavings every day while I was collecting hatching eggs for the week. I gently wiped off some of them (not washed) and left some of them just to see if there was a difference in the hatching percentages. From what I can tell they are all growing the same. There was one egg that must not of been fertile cause it was still clear when all the others had blood vessels and wiggly shadows. But other then that if I don’t mess something up in the next week I’m counting on lots of fluffy cuteness! Oh, when it says stop turning them three days before the hatch date does that mean to count the hatch date as day three or three days before and then hatch day is day four? And that is the same time I am supposed to increase the humidity right? I’ve had lots of dirty eggs that hatched just fine, but it is better if they aren’t yucky. The thing to watch out for is mushy chick disease. They can get bacteria growing in the yolk sac if it gets through the egg shell. After hatching, they can also get bacteria on the ‘belly button’ which can turn into mushy chick. That would be the thing to watch out for. If you don’t have any antibiotics for poultry on hand, you might want to pick some up, just in case. Hopefully you don’t have to worry. Yes, you do want the humidity to be higher for the last three days so that they are able to break through the membrane and shell. For the first 18 days the relative humidity in the incubator should be around 65% and then it should be raised to about 75-80% for the last three days. I don’t have a way to measure humidity yet, so I’ve always used the tray system as outlined in the directions for my incubator. 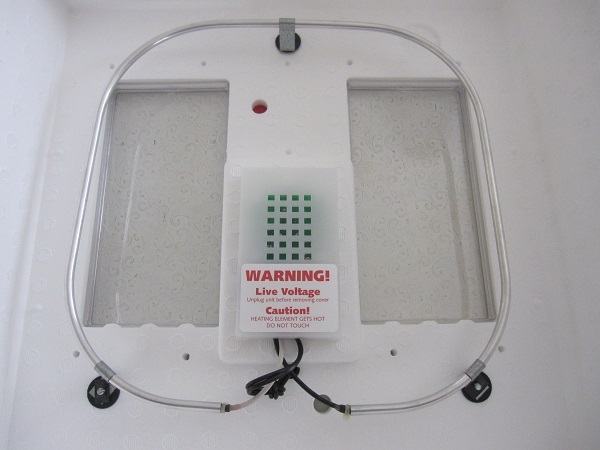 But with a homemade incubator, you might want to check into a hygrometer for your next hatch. For the 3 day lockdown period, it depends somewhat on what time of the day you put the eggs in the incubator. I count back from the time that I started the incubation. So if I put them in the incubator in the morning, I count back 3 days from that point. Now, there have been times when I forgot and stopped a bit sooner and that didn’t seem to matter, but it really is best if you don’t turn them again within 72 hours of the time of day that you started incubating. I hope that makes sense! The time that it is most critical that you make sure you do a good job of turning the eggs is when the embryo isn’t taking up most of the inside of the shell. Best wishes and let me know how you babies are doing! They hatched! And are doing great! I am so excited it worked. Now that I have been through that experience once I have another question. Is it supposed to take so long? I guess I was under the impression that they would kind of all hatch at pretty close to the same time since I put them all in the incubator at the same time. Like in the same 48ish hours, but mine hatched over a four day period. Some pipped on the 18th and then three hatched early on the 19th with three more hatching on the 20th with the rest hatching on the 21st and 22nd for a total of 25 out of 29 eggs hatching. The last four did not hatch although one did pip, that was all it did. I am not sure but I feel like that was a pretty good hatch rate, especially for my first time. I have plans to modify my incubator some and then do some chicken eggs. I had a hard time getting the humidity up high enough at the end after I put paper towels down on the wire for the babies to keep their little feet safe. I have to figure a way to keep the circulation going over the water and keep the babies safe at the same time. Thanks for your site, I learn so much. When I put eggs in the incubator, I put them all in at the same time (same day, same time) with very few exceptions…I’ve added a couple later on the same day. But even though I put them all in on the same day, there have been times when the hatch has taken place over 2 or 3 days. I think it depends on when the eggs were laid, maybe, and conditions in the incubator. So, next time, put them in right at the same time so that you can keep them in the incubator until they have all finished hatching. When you open the incubator to take out the hatchlings, the humidity decreases, reducing the likelihood that the rest will be able to hatch. If you have trouble keeping the humidity high enough during the last 3 days (lockdown period when you shouldn’t open the incubator at all), Put a shallow tray in the incubator with some clean sponges and add some water to the tray. Not enough that they can get in and drown, just enough to keep the humidity up.